One of the key objectives of most websites, is moving leads through the stages of your marketing funnel. The efficiency at which prospects travel through each stage has a multiplying impact on the number of website visitors that ultimately end up as customers. Having healthy conversion rates through out your funnel will generate a consistent number of Leads, Prospect and Customers exponentially. Conversion Rate Optimization, also known as CRO, is the continuous cycle of Measurement, Data Analysis and Improvement. The definition on Wikipedia is, in all honesty, the best possible definition. This definition really sums it up. They refer to it here as a ‘system’, which is exactly what it is. It’s not a quick-fix that you can perform to your website. Its a methodology that is applied continuously. How do I calculate Conversion Rate? Website Traffic by Source, Page, Keywords, etc.. Most CRO-related KPIs can be measured using Google Analytics. You will need to set up goal conversion tracking for some metrics, and link to your e-commerce website to track Revenue (if applicable). Once data is collected, you can then analyse the data for opportunities for improvement. There is no specific timeframe for how long each stage of CRO should last. That is really up to the resources of your marketing team, and how aggressive your goals are. Now that you have all of your website data, you can start by identify patterns and areas of concern. I use a tool called Databox to build custom dashboard, and that allows me to have a visual representation of my conversion funnel. This makes it easier to spot bottlenecks in the conversion path, and where the drop-off rate is too high. You can create custom reports using Google Analytics to help show data that is specifically helpful for Conversion Rate Optimization. User behaviour reports can help to point out where in your user journey has the highest drop-off point. This can show data that can help you optimize the user journey for higher conversion. Device reports can tell you if mobile has a significantly lower conversion rate than desktop browsing. This could mean that your mobile layout is not optimized quite as well to convert users. You can measure conversions by channel, to see if there are any digital channels that are producing low-converting traffic. This can help you to tweak specific campaigns to attract more qualified leads. You can run reports on goal completions by browser. Different internet browsers render things differently, so by creating this report, you can check if there are any browsers where the users are completing goal far less than others. You can measure site load speed and bounce rates to indicate if your website speed is affecting your conversion rates. You get my point….. Google Analytics can tell you a lot about your conversion. It’s powerful, it’s free. Make sure you are making the most of it! A/B Testing plays a big role in finding the conversion rate of a page. Often assumptions are made by marketers, and the best way to test assumptions is by benchmark testing. By conducting thorough comparative testing on based on all 3 of these factors, you can continuously optimize conversions based on real data. 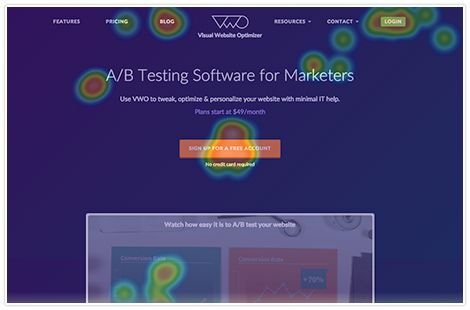 VWO is one of the most widely used enterprise-level tools for this, and is a purpose-made platform for A/B testing and advanced Conversion Rate Optimization. Hubspot also has native A/B testing features. You can also use tools like Hotjar and CrazyEgg for heat-maps, scroll-maps, and recording videos of user sessions. Hubspot also has built-in analytics for Landing Pages, CTAs, Blogs, and Forms. All of which display views, submissions and conversion rates. This allows you to easily which ones perform better than others, so you can optimize them accordingly. There are few tactics I have found that give your conversion rates a boost. These are just from my own experimentation, and I encourage you to try different things out, and find what works best for you. Its important to structure your homepage headings in a way that encourages conversion. Some marketers fall into the trap of trying to be over-creative with headings. They usually end up with ‘fluffy’ text that doesn’t really convey their value proposition. Subheading: Whats in it for me? CTA: Where to go from here? Seeing a form with 20 different questions, that needs 3 full scrolls to see, will probably fail to convert a high number of leads. People just get put off by long forms. Make it easier for asking them the fewest necessary questions. First Name and Email are really all you need to get going with lead nurturing. A few of more, such as Surname, Industry, Job Title, URL, Phone, etc are important too in some cases. You can always make use of Smart Fields, which are available in many marketing automation platforms, such as Hubspot. Smart fiels are basically fields that ‘swap out’ once the fields are already populated in the CRM. For example, if you already know the lead’s Company URL, and that is one of the form fields, your marketing automation can detect (via cookies) who the person is filling out the form, and change the already-known field with something unknown, such as Phone Number. Often referred to as pop-ups, or slide-up/down banners, Lead flows increase conversion by simply making a CTA or content offer more obvious. We are so used to seeing CTA-smothered blog posts or landing pages, that the CTAs often become invisible. Lead flows disrupt (in a good way) the user’s browsing, which makes the call-to-action jump out. Lead flows can be triggered by a certain action, such as 50% scroll, exit intent, or duration on page, meaning we can really target the CTA timing appropriately. Having a website that consistently generates good quality leads really pays off. It takes a lot of work to push decent volumes of traffic to your site, so it makes sense in investing a lot of time and resources into making sure as much of that traffic converts as possible. Just remember, CRO is an ongoing system, and should always play big part in your ongoing digital marketing strategy. You should’t stop after just bumping up a couple of conversion points by 1 or 2 percent. It should be something you continuously, time and time again, to get the steady flow of inbound leads. Most people want to design a website that they can leave untouched for a long time, but as you can see from what I’ve written, it’s an ongoing evolutionary process along with carefully observing the conversion data.